The S2 Secondary Shock System utilizes the factory lower control arms and maintains OE track width while a combination of a billet aluminum shock tower adapters, fabricated shock hoops, and steel skidplates (with incorporated shock mounts) make for a straightforward install with the exceptional build quality you would expect from an ICON Vehicle Dynamics product. 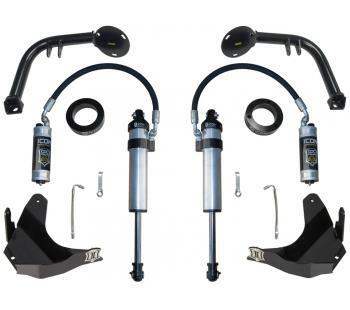 The system was designed to eliminate the need for any major alteration of the vehicle’s frame or any other factory suspension components, and the components are 100% removable in case the system is to be installed on another vehicle. The modular design of the S2 kit also allows for standalone installation of the skid plates, which provides the added benefit of protecting the factory lower control arms from potential trail damage that can be experienced while off-road.